Last year, I put together a simple dashboard of sorts. It runs on an old iPhone 3, which now sits on the kitchen counter. The iPhone is in guided access mode, so hitting the home button wakes it up to the screen shown here without having to slide to unlock or enter a passcode. Recently, I wanted to add some information from New Jersey Transit. 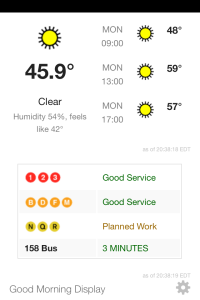 With just a bit of research, I found that the good people at New Jersey Transit provide MyBus Now, a very nice real-time bus location service. I was able to incorporate the date into the Good Morning Display quite easily. So, now I know when the next bus is arriving. The latest code is on GitHub.